The Naxalite–Maoist insurgency is an ongoing conflict between Maoist groups known as Naxalites or Naxals and the Indian government. The conflict in its present form began after the 2004 formation of the Communist Party of India (Maoist) (CPI-Maoists), a rebel group composed of the People's War Group (PWG) and the Maoist Communist Centre (MCC). In January 2005, talks between the Andhra Pradesh state government and the CPI-Maoists broke down and the rebels accused authorities of not addressing their demands for a written truce, release of prisoners and redistribution of land. The ongoing conflict has taken place over a vast territory (around half of India's 29 states) with hundreds of people being killed annually in clashes between the CPI-Maoists and the government every year since 2005. However, it is now confined to only few districts of Chhattisgarh, Andhra Pradesh, Telangana and Maharashtra. The armed wing of the Naxalite–Maoists is called the People's Liberation Guerrilla Army (PLGA) and is estimated to have between 6,500 and 9,500 cadres, mostly armed with small arms. According to a study of the newspaper The Times of India, 58% of people surveyed in the state of Andhra Pradesh have a positive perception of the guerrilla, against only 19% against it. The Naxalites have frequently targeted tribal, police and government workers in what they say is a fight for improved land rights and more jobs for neglected agricultural labourers and the poor. The Naxalites claim that they are following a strategy of rural rebellion similar to a protracted people's war against the government. In February 2009, the Indian central government announced a new nationwide initiative to be called the Integrated Action Plan (IAP) for broad co-ordinated operations aimed at dealing with the Naxalite problem in all affected states, namely Karnataka, Chhattisgarh, Odisha, Andhra Pradesh, Maharashtra, Jharkhand, Bihar, Uttar Pradesh and West Bengal. This plan included funding for grass-roots economic development projects in Naxalite-affected areas as well as increased special police funding for better containment and reduction of Naxalite influence. After the first full year of implementation of the national IAP program, Karnataka was removed from the list of Naxal-affected states in August 2010. In July 2011, the number of Naxal-affected areas was reduced to (figure includes proposed addition of 20 districts) 83 districts across nine states. In December 2011, the national government reported that the number of Naxalite related deaths and injuries nationwide had gone down by nearly 50% from 2010 levels. Naxalites are a group of far-left radical communists, supportive of Maoist political sentiment and ideology. Their origin can be traced to the splitting in 1967 of the Communist Party of India (Marxist), leading to the formation of the Communist Party of India (Marxist–Leninist). Initially the movement had its centre in West Bengal. In recent years, it has spread into less developed areas of rural central and eastern India, such as Chhattisgarh and Andhra Pradesh through the activities of underground groups like the Communist Party of India (Maoist). 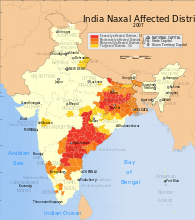 In 2007, it was estimated that Naxalites were active across "half of the India's 28 states" who account for about 40 percent of India's geographical area, an area known as the "Red Corridor", where according to estimates they had influence over 92,000 square kilometers. In 2009, Naxalites were active across approximately 180 districts in ten states of India In August 2010, Karnataka was removed from the list of Naxal-affected states In July 2011, the number of Naxal-affected areas was reduced to (including proposed addition of 20 districts) 83 districts across nine states. The Naxalites operate in 60 districts in India, mainly in the states of Odisha (5 affected districts), Jharkhand (14 affected districts), Bihar (5 affected districts), Andhra Pradesh, Chhattisgarh (ten affected districts), Madhya Pradesh (8 affected districts), Maharashtra (2 affected districts) and West Bengal (8 affected district). In West Bengal areas west of Howrah are affected by the insurgency. Chhattisgarh is the epicentre of the conflict (2007). Areas governed by the elected Communist Party of India (Marxist) in India such as West Bengal, specifically those of Jangalmahal and Lalgarh, are some of the worst affected by anti-state violence by Maoist groups who cite the accumulation of unaccounted-for wealth in the hands of CPI-M leaders and specific failure to counter problems they were elected to address such as caste discrimination and poverty. There is a correlation between areas with extensive coal resources and impact of the insurgency. Naxalites conduct detailed socio-economic surveys before starting operations in a target area. It is claimed that the insurgents extort 14 billion Indian rupees (more than $US300 million). In Chhattisgarh, Salwa Judum, an anti-insurgency operation which was aimed at countering the naxalite violence in the region was launched in 2005. The militia consisting of local tribal youth received support and training from the Chhattisgarh state government. The state came under fire from pro-Maoist activist groups for "atrocities and abuse against women", employing child soldiers, and looting and destruction of property, allegations rejected by a fact finding commission of the National Human Rights Commission of India (NHRC) in 2008. The commission, which had been appointed by the Supreme Court of India, determined that the Salwa Judum was a spontaneous reaction by tribals against Maoist atrocities perpetrated against them. On 5 July 2011, the Supreme Court of India declared the militia to be illegal and unconstitutional, and ordered its disbanding. The Court directed the Chhattisgarh government to recover all the firearms, ammunition and accessories. In the court's judgement, the use of Salwa Judum by the government for anti-Naxal operations was criticised for its violations of human rights and for employing poorly trained youth for counter-insurgency roles. The Supreme Court of India, also ordered the government to investigate all instances of alleged criminal activities of Salwa Judum. In Bihar, the Ranvir Sena, a caste-supremacist paramilitary of the upper-caste landlords and proscribed terrorist organisation by the Indian government, has been known to kill Dalit civilians in retaliation for Naxalite activity. In Odisha, the number of districts affected by Maoist activities has been reduced from 17 to 9, as claimed by the Director General of Police (DGP), Prakash Mishra on December 30, 2012. Similar paramilitary groups have emerged in Andhra Pradesh during the last decade. Some of these groups are Fear Vikas, Green Tigers, Nalladandu, Red Tigers, Tirumala Tigers, Palnadu Tigers, Kakatiya Cobras, Narsa Cobras, Nallamalla Nallatrachu (Cobras) and Kranthi Sena. Civil liberties activists were murdered by the Nayeem gang in 1998 and 2000. On 24 August 2005, members of the Narsi Cobras killed an individual rights activist and schoolteacher in Mahbubnagar district. In 2006, Prime Minister Manmohan Singh called the Naxalites the "single biggest internal security challenge ever faced by our country". In June 2011, he said, "Development is the master remedy to win over people", adding that the government was "strengthening the development work in the 60 Maoist-affected districts. In 2010 the Indian government's Home Secretary, Gopal Krishna Pillai, acknowledged that there are legitimate grievances regarding local people's access to forest land and produce and the distribution of benefits from mining and hydro power developments, but claims that the Naxalites' long-term goal is to establish an Indian Marxist state. He said the government decided to tackle the Naxalites head-on, and take back much of the lost areas. In 2011, Indian police accused the Chinese government of providing sanctuary to the movement's leaders, and accused Pakistani ISI of providing financial support. The People's War Group (PWG) intensified its attacks against politicians, police officers, and land and business owners in response to a July ban imposed on the group by the Andhra Pradesh government. The government responded by tightening security, allegedly ordering attacks on suspected PWG members by state police and the "Green Tigers". Police forces continued to have virtual impunity for the killing of PWG rebels during police encounters. The Maoist Communist Center rebels intensified their armed campaign against Indian security forces following the killing of their leader by police in December. An estimated 140 people were killed in fighting between the PWG and government forces throughout the year. According to government reports, 482 people have died during the conflict that year. The conflict in Andhra Pradesh intensified as Naxalite rebel groups, in particular the PWG, continued guerrilla attacks on police and government targets while the security forces stepped up counter-insurgency efforts. An October assassination attempt on Chief Minister N. Chandrababu Naidu was consistent with the PWG’s practice of targeting government officials to draw attention to their cause. According to independent media reports, as many as 500 people were killed in the conflict this year, half of these Maoist rebels. Sporadic, low-intensity fighting between the PWG and government forces continued for most of the year. Attacks on police and TDP party officials, believed to be carried out by the PWG, accounted for most major incidents and deaths. A three-month cease-fire, announced in late June, led to failed negotiations between the government and the PWG. A few days into the cease-fire, an attack attributed to the PWG placed the cease-fire in jeopardy. More than 500 people were killed in sporadic, low-intensity fighting, a reduction from previous years. Most victims were members of the police forces or the Telugu Desam Party (a regional political party). Violent clashes between Maoist rebels and state security forces and paramilitary groups increased following the breakdown of peace talks between the PWG and the state government of Andhra Pradesh. Rebels continued to employ a wide range of low-intensity guerrilla tactics against government institutions, officials, security forces and paramilitary groups. For the first time in recent years, Maoist rebels launched two large scale attacks against urban government targets. Fighting was reported in 12 states covering most of south, central and north India with the exception of India’s northeast and northwest. More than 700 people were reported killed this year in violent clashes. Over one-third of those killed were civilians. Maoist attacks continued, primarily on government and police targets. Civilians were also affected in landmine attacks affecting railway cars and truck convoys. Clashes between state police and rebels also resulted in deaths of members of both parties, and civilians that were caught in the firing. Fighting differs from state to state, depending on security and police force responses. In the state of Andhra Pradesh, security forces have been somewhat successful in maintaining control and combating Maoist rebels. The other state that is most affected, Chhattisgarh, has seen an increase in violence between Maoist rebels and villagers who are supported by the government. In 2006, 500 to 750 people were estimated killed, fewer than half Naxalites, and approximately one-third civilians. Fighting continued between Naxalite Maoists and government security forces throughout the year. The majority of hostilities took place in Chhattisgarh, which turned especially deadly when over 400 Naxalites attacked a Chhattisgarh police station, seizing arms and killing dozens. In November 2007, reports emerged that anti-SEZ (Special Economic Zone) movements such as the Bhoomi Uchched Pratirodh Committee in Nandigram in West Bengal, which arose after the land appropriation and human displacement following the SEZ Act of 2005, have joined forces with the Naxalites since February to keep the police out. Recently, police found weapons belonging to Maoists near Nandigram. Civilians were forced to choose between joining the Maoist insurgence or supporting the Salwa Judum and face coercion from both sides. According to news reports, this conflict resulted in 650 deaths during 2007; of these 240 were civilians, 218 security personnel and 192 militants. Civilians were most affected in the ongoing fighting between Maoist rebels and government security forces. Of the 16 states touched by this conflict, Chhattisgarh and Jharkhand were the most affected. One positive note for Chhattisgarh was that fatalities, although still high, were significantly down from 2007. Similarly, Andhra Pradesh, the state with the most Maoist activity a few years ago, has improved security with a corresponding drop in fatality rates. Unfortunately, as conditions have improved in Chhattisgarh and Andhra Pradesh, the Maoist forces seem to have shifted their operations to the state of Orissa where conditions have worsened. South Asia Terrorism Portal’s fatality count across the six states that saw the majority of the fighting (Bihar, Orissa, Jharkhand, Maharashtra, Chhattisgarh, and Andhra Pradesh) was 794. This included 399 civilians, 221 security force personnel and 174 insurgents. In 2009, Naxalites were active across approximately 180 districts in ten states of India. In September 2009, India's Prime Minister Manmohan Singh admitted that the Maoists had growing appeal among a large section of Indian society, including tribal communities, the rural poor as well as sections of the intelligentsia and the youth. He added that "Dealing with left-wing extremism requires a nuanced strategy – a holistic approach. It cannot be treated simply as a law and order problem." In the first half of 2009, 56 Maoist attacks were reported. The South Asia Terrorism Portal reported 998 killed in the conflict: 392 civilians, 312 security forces and 294 rebels. During February 2010, the Silda camp attack killed 24 paramilitary personnel of the Eastern Frontier Rifles in an operation the guerillas stated was the beginning of "Operation Peace Hunt", the Maoist answer to the government "Operation Green Hunt" that was recently launched against them. According to Crisis Watch and various news sources, between 500 and 600 people were killed this year. Of those killed, approximately 366 were civilians, 188 were government troops (including police) and 27 were Naxalites. According to South Asia Terrorism Portal and government sources, over 1,000 deaths occurred in the conflict this year. This includes 277 security forces, 277 Naxalites, and more than 600 civilian. On 6 April 2010, Naxalite rebels killed 76, consisting of 74 paramilitary personnel of the CRPF and two policemen. Fifty others were wounded in the series of attacks on security convoys in Dantewada district in the central Indian state of Chhattisgarh. The attack resulted in the biggest loss of life security forces have suffered since launching a large-scale offensive against the rebels. On 17 May, a Naxalite landmine destroyed a bus in Dantewada district, killing up to 44 people including several Special Police Officers (SPOs) and civilians. On 28 May 2010, the derailment of a Kolkata–Mumbai night train killed at least 150 persons. Police alleged that Maoists had caused the derailment by removing a short (46 cm or 1½ft) piece of track, but the Maoists denied this. On 29 June 2010, at least 26 policemen are killed in a Maoist attack in the central Indian state of Chhattisgarh. On 29 August 2010, a joint team of BSF and district police was attacked by the rebels in Bhuski village (Chhattisgarh) under Durg Kondal police station in the district while they were conducting routine search operations in the wee hours. Following the attack, the forces retaliated and in the action they lost five security personnel, including three BSF jawans. On 29–30 August 2010, rebels ambushed a joint paramilitary-police team in Bihar, killing 10, wounding 10 more, taking 4 prisoners and robbing more than 35 automatic rifles from the state forces. The Naxalites later freed 3 of the policemen after Naxal leader Kishenji met with worried family members. On 12 September 2010, Naxalites killed 3 policemen and took 4 more hostage in an ambush in Chhattisgarh. The 4 policemen were later released without conditions after Naxal leaders listened to the appeals of family members. The freed policemen also promised the Naxals to never take up arms against the insurgency again. On 5 October 2010, rebels killed 4 Police officers as they were on their way to a market in Maharashtra. On 7 October 2010, Naxalites attempted derailment of Triveni express, a train of Singrauli-Bareilly route, by removing 4 fishplates and 42 sleeper clips. On 8 October 2010, Naxalites triggered a landmine in the border area between Chhattisgarh and Maharashtra. The attack killed 3 Indo-Tibetan Border Police (ITBP) jawans, wounded 2 more and destroyed a military jeep. During May 2011, Naxalites killed and dismembered ten policemen, including one senior officer in the Gariyaband, Chhattisgarh area on the border with Orissa. In June, the total fatalities of both the police and the paramilitary was 43. On 21 July 2011, Maoist rebels in the central Indian state of Chhattisgarh blew up a bridge, killing four people and wounding five others. The attack happened when the Congress party chief of the state, Nandkumar Patel, was returning from a party function. Despite the continued violence in 2011, the most recent central government campaign to contain and reduce the militant Naxalite presence appears to be having some success, the 2011 toll of 447 civilians and 142 security personnel killed having been nearly 50% lower than the 2010 toll. Some states experiencing this sharp reduction in Naxalite hostilities, such as Madhya Pradesh, attribute their success to their use of IAP funds for rural development. In mid-March, Maoist rebels kidnapped two Italians in Orissa. They later released one, while the government of Orissa negotiated for the release of the second. The Maoists released the second hostage in the middle of April. The Member of the Legislative Assembly(MLA) of Laxmipur constituency (Orissa), Jhin Hikka, was abducted by the Maoists in March, who demand the release of 30 Maoist cadres (presently in jail) in exchange for the freedom of the MLA. The Orissa Government is negotiating with the cadres with the help of arbitrators to free the MLA. On 27 March 2012, an explosion blamed on Maoists killed 15 Indian policemen in Maharashtra. The 2013 Naxal attack in Darbha valley resulted in the deaths of around 24 Indian National Congress leaders including the former state minister Mahendra Karma and the Chhattisgarh Congress chief Nand Kumar Patel. 28 February 2014: 6 police personnel, including a SHO, killed in Maoist attack in Chhattisgarh. 11 March 2014: 15 security personnel and 1 Civilian were killed in Chhattisgarh Naxal attack in Tongpal village, close to the Darbha Ghat area, of Sukma district in south Chhattisgarh, while they were engaged in a road opening exercise in the area. 11 May 2014: 7 police commandos killed in a Maoists landmine blast in the forests of Gadchiroli district of Maharashtra. Force (CAF) Jawans were killed in a Maoist ambush near Kirandul, Dantewada, Chhattisgarh. 24 April 2017: 25 CRPF Jawans were killed in Sukma, Chhattisgarh, in an attack by Maoists. 13 March 2018: 2018 Sukma attack: 9 CRPF personnel were killed in Sukma, Chhattisgarh after their mine protected vehicle (MPV) was blown up by Maoists. 24 April 2018: 34 militants were killed by Indian authorities in central India. The first combat deaths of the insurgency were in 1980. Around 1,100 people are known to have died during 2009. The number includes 600 civilians, 300 security personnel and 200 rebels. There were more than 40,000 displaced people in 2006. According to the Institute of Peace and Conflict studies, Naxal groups have recruited children in different capacities and exposed them to injury and death. However the same accusation has been levelled at the state-sponsored Salwa Judum anti-Maoist group, and Special Police officers (SPOs) assisting the government security forces. Seven personnel of Special Task Force (STF) were killed and eleven others injured in an encounter with outlawed Communist Party of India (Maoist) rebels at a village near Chhattisgarh's Bastar region on Saturday. Additional director general of police (anti-Naxal operations) Rajinder Kuamr Vij said that the encounter took place at Pidmal village between Dornapal and Chintagufa when the rebels tried to attack the security personnel. The forces retaliated leading to a fierce encounter during which seven security personnel died and eleven others injured. The team of 49 STF men which ventured into the Maoists’ liberated zone on Saturday morning, had reportedly not informed senior police officers based in Bastar and Sukma before embarking on an operation which eventually proved “suicidal.” Seven personnel, including the Platoon Commander, Shankara Rao, were gunned down by the Maoists. According to the BBC, more than 6,000 people have died during the rebels' 20-year fight between 1990 and 2010. Al Jazeera put the death toll at more than 10,000 between 1980 and 2011. Based on the above displayed statistics, it can be determined that more than 13,000 people have been killed since the start of the insurgency in 1980, most of them in the period since 1996. To enforce their control over the population, the Maoists have convened kangaroo courts to mete out summary justice, normally death. beatings, or exile. ^ "Maoist Communist Centre - Left Wing Extremism, India, South Asia Terrorism Portal". Archived 12 August 2012 at WebCite. Satp.org. Retrieved 21 May 2014. ^ a b c d e "Pakistan and the Naxalite Movement in India". Stratfor. 18 November 2010. Archived from the original on 30 March 2018. ^ a b "A crackdown in Tamil Nadu". Frontline. 20 December 2002. ^ "Philippine reds export armed struggle". Atimes.com. 22 April 2010. Retrieved 21 May 2014. ^ "'Bangla Maoists involved in plan to target PM'". The Sunday Guardian. 9 June 2018. ^ "Maoists building weapons factories in India with help from North Korea". India Today. 26 April 2012. korean-intelligence-training-and-funding-maoists-in-india-100359-2012-04-26 Archived Check |archiveurl= value (help) from the original on 23 January 2018. ^ "The Naxalites: India's Extreme Left-Wing Communists" (PDF). Central Intelligence Agency. 26 October 1970. Archived (PDF) from the original on 30 March 2018. ^ Stewart-Ingersoll, Robert (2012). Regional Powers and Security Orders. Routledge. p. 240. ^ "ISI-Naxal alliance to spell trouble". Times of India. 15 August 2010. Archived from the original on 14 November 2010. ^ "How ISI-Naxal ties were forged". Rediff.com. 19 October 2010. Archived from the original on 30 March 2018. ^ "Anti-Naxal operations will be intensified: CRPF chief Pranay Sahay". Indiatimes. January 11, 2013. Retrieved 31 March 2013. ^ "Five CRPF officers dead in suicide attack as fidayeen extremists disguised as cricket players turn grenade launchers on Srinagar school". Daily Mail. 14 March 2013. Archived from the original on 12 October 2017. ^ Srivastava, Mehul (29 July 2010). "Maoists in India Blow Up Pipelines, Putting $78 Billion at Risk". Bloomberg. Archived from the original on 2 August 2010. ^ "Indian police battle Naxalites". Al Jazeera English. Archived from the original on 17 December 2009. Retrieved 26 October 2014. ^ "India's Failing Counterinsurgency Campaign". Archived 23 October 2014 at the Wayback Machine. Foreignpolicy.com. Retrieved 21 May 2014. ^ "India faces internal challenge from Maoist-Naxalites". Thefinancialexpress-bd.com. Archived from the original on 3 June 2015. Retrieved 26 October 2014. ^ a b c d "Fatalities in Left-wing Extremism: 1999-2016* (MHA)". Archived from the original on 1 October 2017. Retrieved 26 October 2014. ^ a b c d e "Armed Conflicts Report – India-Andhra Pradesh" (PDF). Ploughshares. Archived (PDF) from the original on 18 March 2009. Retrieved 17 March 2009. ^ a b "India's Naxalites: A spectre haunting India". The Economist. 12 April 2006. Archived from the original on 23 May 2010. Retrieved 13 July 2009. ^ a b Handoo, Ashook. "Naxal Problem needs a holistic approach". Press Information Bureau. Archived from the original on 8 September 2009. Retrieved 8 August 2009. ^ "Primer: Who are the Naxalites? : Rediff.com news". Us.rediff.com. Archived from the original on 4 May 2009. Retrieved 13 July 2009. ^ TNN (28 September 2010). "58% in AP say Naxalism is good, finds TOI poll". timesofindia.indiatimes.com. Archived from the original on 11 February 2017. Retrieved 19 May 2017. ^ "CENTRAL/S. ASIA – 'Maoist attacks' kill Indian police". Al Jazeera English. 15 March 2007. Archived from the original on 13 July 2009. Retrieved 13 July 2009. ^ "Communists Fight in India « Notes & Commentaries". Mccaine.org. Archived from the original on 27 July 2011. Retrieved 13 July 2009. ^ "Special project for Naxal areas to be extended to 18 more districts". The Times Of India. India. 2011-12-08. Retrieved 2012-01-02. Times of India describes some details of ongoing nationwide Naxalite containment program, its "Integrated Action Plan". ^ Co-ordinated operations to flush out Naxalites soon Archived 10 February 2009 at the Wayback Machine The Economic Times, 6 February 2009. ^ a b "Karnataka no longer Naxal infested". The Times Of India. India. 26 August 2010. Archived from the original on 2 September 2011. ^ a b Centre to declare more districts Naxal-hit Archived 7 January 2014 at WebCite. Indian Express (2011-07-05). Retrieved on 2014-05-21. ^ a b c Press Information Bureau English Releases Archived 5 September 2012 at the Wayback Machine. Pib.nic.in. Retrieved on 2014-05-21. ^ a b "Development plan for Naxal-hit districts shows good response". The Times Of India. India. 23 June 2011. Archived from the original on 2 September 2011. ^ a b "Kidnapped Chhattisgarh Cong chief, son found dead". The Hindu. 26 May 2013. Archived from the original on 10 June 2013. Retrieved 26 May 2013. ^ Handoo, Ashook. "Naxal Problem needs a holistic approach". Press Information Bureau. Archived from the original on 8 September 2009. Retrieved 8 August 2009. ^ "West Bengal: Districts Affected by Naxalite Activity". Satp.org. Archived from the original on 17 July 2009. Retrieved 13 July 2009. ^ "Asian Centre for Human Rights". Achrweb.org. Archived from the original on 22 August 2006. Retrieved 13 July 2009. ^ Naxals make life tough for CPM cadres in WB - IBNLive Archived 13 October 2012 at the Wayback Machine. Ibnlive.in.com. Retrieved on 2014-05-21. ^ 9 August 2006 (2006-08-09). "Asia Times Online :: South Asia news – Hidden civil war drains India's energy". Atimes.com. Retrieved 2009-07-13. ^ J. Venkatesan. ""Salwa Judum is illegal, says SC" The Hindu July 5, 2011". The Hindu. Archived from the original on 29 October 2013. Retrieved 26 October 2014. ^ "Indian state 'backing vigilantes'". BBC News. BBC. 15 July 2008. Archived from the original on 30 January 2009. Retrieved 12 April 2010. ^ Hearing plea against Salwa Judum, SC says State cannot arm civilians to kill Indian Express, 1 Apr 2008. ^ "dnaIndia". dna. Retrieved 26 October 2014. ^ "Report recommends withdrawal of Salwa Judum". The Hindu. Chennai, India: The Hindu Group. 19 January 2007. Archived from the original on 23 July 2010. Retrieved 12 April 2010. ^ "The Adivasis of Chhattisgarh: Victims of the Naxalite Movement and Salwa Judum Campaign" (PDF). Asian Centre for Human Rights. New Delhi: Asian Centre for Human Rights: 42. 2006. Archived from the original (PDF) on 19 March 2010. Retrieved 12 April 2010. ^ "Caught between Rebels and Vigilantes". Reuters Alertnet. Reuters. 27 August 2008. Archived from the original on 17 August 2009. Retrieved 30 January 2010. ^ "Salwa Judum victims assured of relief". The Hindu. Chennai, India: The Hindu Group. 2008-12-16. Archived from the original on 26 December 2008. Retrieved 2010-04-12. ^ 'Existence of Salwa Judum necessary' Archived 10 August 2016 at the Wayback Machine The Economic Times, 6 Oct 2008. ^ "The Vigilante groups: Of the tigers and cobras". Asian Centre for Human Rights. Archived from the original on 2007-12-20. Retrieved 2010-04-12. ^ Asian Centre for Human Rights. Achrweb.org. Retrieved on 2014-05-21. ^ Development master remedy against Maoists: PM Archived 1 June 2012 at the Wayback Machine. TwoCircles.net (2011-06-30). Retrieved on 2014-05-21. ^ "timesofindia.indiatimes.com/india/Maoists-looking-at-armed-overthrow-of-state-by-2050/articleshow/5648742.cms". The Times of India. Retrieved 26 October 2014. ^ "Cops nail China link with Naxals". The Times Of India. India. 2011-10-08. Retrieved 2011-12-31. Times of India describes new findings of China ISI links to Naxal movement. ^ "Reports see Maoist Hand in Nandigram", Monideepa Bannerjie, New Delhi Television, 8 November 2007. ^ "India is 'losing Maoist battle'". BBC News. 15 September 2009. Archived from the original on 19 March 2014. Retrieved 20 May 2010. ^ Bhaumik, Subir (2010-02-16). "India Maoists attack troops' camp". BBC News. Retrieved 2010-05-20. ^ a b "Scores of Indian soldiers killed in Maoist ambushes". BBC World. 6 April 2010. Archived from the original on 8 April 2010. ^ "Naxals blow up bus near Dantewada, 30 Killed". Archived from the original on 20 May 2010. Retrieved 18 May 2010. ^ "Sixty five dead after 'sabotage' derails Indian train". British Broadcasting Corporation. 28 May 2010. ^ Naxals ambush, kill 26 CRPF men in Chhattisgarh. Hindustan Times. Retrieved on 2014-05-21. ^ Naxals kill 5 security personnel in encounter - IBNLive Archived 2 September 2010 at the Wayback Machine. Ibnlive.in.com. Retrieved on 2014-05-21. ^ Maoists kill 10 security men in Bihar Archived 2 September 2010 at the Wayback Machine. Sify.com (2010-08-30). Retrieved on 2014-05-21. ^ "Combing operation launched to trace kidnapped policemen". The Hindu. Chennai, India. 31 August 2010. Archived from the original on 3 September 2010. ^ 'Kishenji' visits cop's kin, assures release. Hindustan Times. Retrieved on 2014-05-21. ^ "India's Maoists kill three police, abduct four: police". Archived from the original on 24 January 2013. Retrieved 8 October 2010. ^ After 12 days, Maoists release 4 abducted cops Archived 3 October 2010 at the Wayback Machine. Indian Express (2010-10-01). Retrieved on 2014-05-21. ^ Maoists kill four Maharashtra cops Archived 11 August 2011 at the Wayback Machine. Sify.com (2010-10-05). Retrieved on 2014-05-21. ^ Naxalites hold lineman hostage, remove fish plates Archived 17 January 2011 at the Wayback Machine. Indian Express (2010-10-07). Retrieved on 2014-05-21. ^ Landmine blast leaves three ITBP jawans dead in Chhattisgarh. Hindustan Times (2010-10-08). Retrieved on 2014-05-21. ^ "Indian Maoists 'kill and dismember' 10 policemen". BBC News. 24 May 2011. Archived from the original on 24 May 2011. ^ "Indian Army Raises the Stakes in Its War Against the Maoists". TIME. 27 June 2011. Archived from the original on 30 June 2011. ^ "www.bbc.co.uk". BBC News. Archived from the original on 23 October 2015. Retrieved 26 October 2014. ^ "MP govt claims positive change in Naxal-hit areas". 2011. Archived from the original on 1 January 2012. Retrieved 2011-01-02. Deccan Chronicle reports success of IAP in Madhya Pradesh. ^ a b "India 'Maoist' bomb blast kills 15 police". BBC News. 27 March 2012. Archived from the original on 28 March 2012. ^ "Six policemen killed in Naxal attack". The Hindu. 28 February 2014. Archived from the original on 5 March 2014. Retrieved 28 February 2014. ^ "20 security personnel feared killed in Chhattisgarh Naxal attack". The Hindu. 11 March 2014. Archived from the original on 11 March 2014. Retrieved 11 March 2014. ^ "Maoists kill 15 Security Personnel in a Deadly Ambush in Sukma, Chhattisgarh". IANS. news.biharprabha.com. Archived from the original on 14 March 2014. Retrieved 12 March 2014. ^ "7 Police commandos killed in a Naxalite Attack in Maharashtra". IANS. news.biharprabha.com. Archived from the original on 12 May 2014. Retrieved 11 May 2014. ^ "Third Maoist attack in 72 hours: four policemen killed in Bastar". The Hindu. The Hindu. April 14, 2015. Retrieved April 14, 2015. ^ "9 CRPF jawans killed in Sukma Maoist attack - Times of India ►". The Times of India. Archived from the original on 19 March 2018. Retrieved 19 March 2018. ^ "India's Maoists offer ceasefire". BBC News. 22 February 2010. Archived from the original on 25 February 2010. Retrieved 20 May 2010. ^ "Reuters AlertNet – Indian Maoist violence". Alertnet.org. Archived from the original on 30 June 2009. Retrieved 13 July 2009. ^ "Articles #2738, Child Soldiers of the Naxal Movement". Ipcs.org. 24 November 2008. Archived from the original on 26 May 2011. Retrieved 13 July 2009. ^ "Seven STF jawans killed, 11 injured in Maoist attack in Bastar". The Times of India. Archived from the original on 9 May 2015. ^ Pavan Dahat. "Sukma Attack Aftermath: STF acted on its own, says Bastar IG". The Hindu. Archived from the original on 27 January 2016. ^ "Fatalities in Left-wing Extremism: 2017". South Asian Terrorism Portal. Archived from the original on 4 January 2018. Retrieved 2 January 2018. ^ a b "Fatalities in Left-wing Extremism: 2018". South Asian Terrorism Portal. Archived from the original on 5 March 2017. Retrieved 10 January 2018. ^ Bhaumik, Subir (10 February 2010). "India's Maoists 'ready for talks'". BBC News. Archived from the original on 1 July 2010. Retrieved 20 May 2010. ^ Al Jazeera Correspondent. "India's Silent War". Archived from the original on 9 November 2011. Retrieved 26 October 2014. ^ Loyd, Anthony (2015). "India's insurgency". National Geographic (April): 95. Retrieved March 13, 2018.